And what a wonderful first week back to work it has been! It has been such a treat to be blogging again, remembering one or two lovely things from my summer and such a joy to know how many of you love Whitby just as much as I do, yay! Today's colour palette is another wee wistful look back to the odd sunny day we were treated to. Many of which I happily spent beach walking and as you know I never come away empty handed. 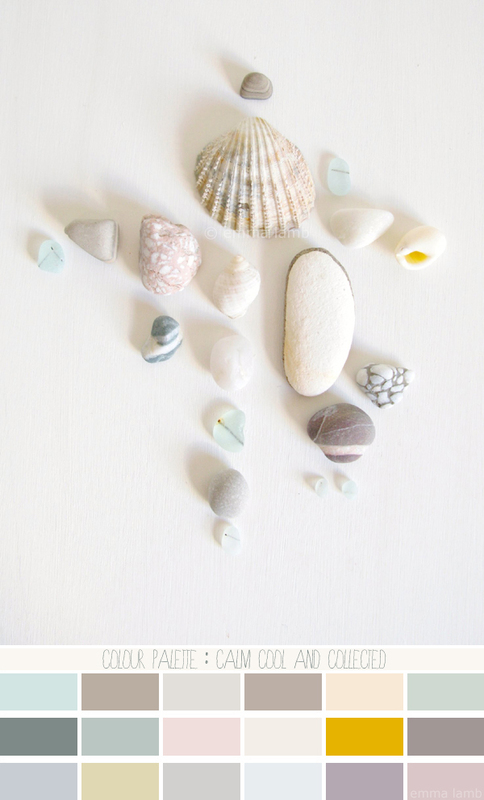 This summer I seem to have had an eye for shades of white, soft glassy blues, powder pink, delicate grey tones and picked up lots of plain ceramic pieces, sparkling white quartz and wired sea glass. They just look so pretty together but while making up this palette I couldn't resist throwing in a wee snippet of mauve and that fabulous pop of bright ochre. Love! I start to appreciate these type of colours more and more. I normally prefer brighter colours. This palette is great! How funny... because I know your jewelry I wouldn't have thought bright colours were your thing at all! what a gorgeous color (guess what country I'm from! LOL) palette. It's giving me ideas for our bedroom makeover which is three years overdue. Mainly because I cannot settle on a color selection that would make both hubby and me happy. But I think this is not SCORE! !